Alan Dunbar with the Georgia Cup. Amateur champion Alan Dunbar rolled in a 12-foot birdie putt on the 18th hole to defeat US Amateur Champion Steven Fox one up to win the 16th annual Georgia Cup match at the Golf Club of Georgia last Thursday. One up playing the last, Dunbar never gave Fox a chance to address his 10-foot birdie putt as he drained an uphill, right to left 12 footer for birdie to close out the match. On a wet, cold day on the Lakeside course, Dunbar - who said with a smile “the weather was great” - came out of the gate fast with birdies on Nos.1 and 2 to offset pars by Fox for a 2-up lead. “Winning the first two holes was key as that definitely gave me confidence,” said the Northern Ireland native, who turns 23 on April 30, and who did not start playing competitive golf until he was 16. “I thought I drove the ball well today and putted well, but missed some makeable putts,” he stated. Fox, who trailed the entire match, pulled within one shot on three occasions – winning Nos.3 and 15 with pars to Dunbar’s bogey’s – and rolled in a 30-foot birdie putt to win the Par-3 17th before Dunbar closed out the match on 18. “The weather made the course play long, but I had some chances to pull even and fought to the end,” said Fox. Dunbar’s largest lead was 3-up after nine. Fox had chances to halve No.9 to stay 2-down and win 11 and 12, but could only capture No.11 with a par-5 as Dunbar three-putted for a bogey 6. The UTC senior three-putted from 10 feet on No.9 for a bogie 6 to trail by three and missed an 8-foot birdie attempt for the win on 11. “I gave him one on nine and he gave me one back on 11, but I still had a chance at the end,” stated Fox. After Fox won No.11, the golfers halved 12-13-14 before Fox won No.15 with a 3-foot par putt and was 1-down. Big Putts for Fox: The UTC golfer stayed within striking distance as he rolled in a 12-footer to halve the par-4 10th, made an important save on the par-3 13th and also halved the par-4 14th with an up-and-down out of the bunker. But at 16, Dunbar made an excellent up and down himself from a greenside bunker for a par-4, while Fox carded a bogey and the lead was back to two before Fox rolled in the long birdie putt on 17. No.18 par-5 .. Dunbar halves hole with a birdie to win 1-up .. in a greenside bunker in 2 … chips 12 feet past and makes the birdie putt to win as Fox’s ball was 10 feet away lying 3. On To The Masters: The two champions will join four other amateur golfers at The Masters Tournament next week. Turning Pro: Dunbar said he plans to turn pro after The Masters, while Fox plans to go pro at the end of the year. Honorary Members: Both golfers and honorary Georgia Cup captain and former Masters Champion Bill Casper were given lifetime honorary memberships to the Golf Club of Georgia. “I will cherish this the rest of my life,” Casper stated. Deep Pockets and Helping Hands: The Wednesday night dinner and auction raised $110,000 for charities. Future UTC Golfer: Ringgold senior Brooks Thomas was at the match play event … he signed with the Mocs last November and will enroll in the fall. Dunbar and Fox are amongst six amateurs who will tee it up in the Masters next Thursday. They are joined by US Mid Amateur champion Nathan Smith, US Public Links champion TJ Vogel, US Amateur runner-up Michael Weaver and 14-year old Chinese player Tianlang Guan. Guan who on the fourth-annual Asia-Pacific Amateur Championship in November and will be the youngest player in the field and the youngest competitor in Masters history - 14 years, 5 months and 17 days old - when play begins. The previous youngest competitor was Matteo Manassero in 2010, who was 16 and qualified by winning the 2009 British Amateur Championship. 2013 (Lakeside) Alan Dunbar (Brit) bt Steven Fox (US) 1 up. 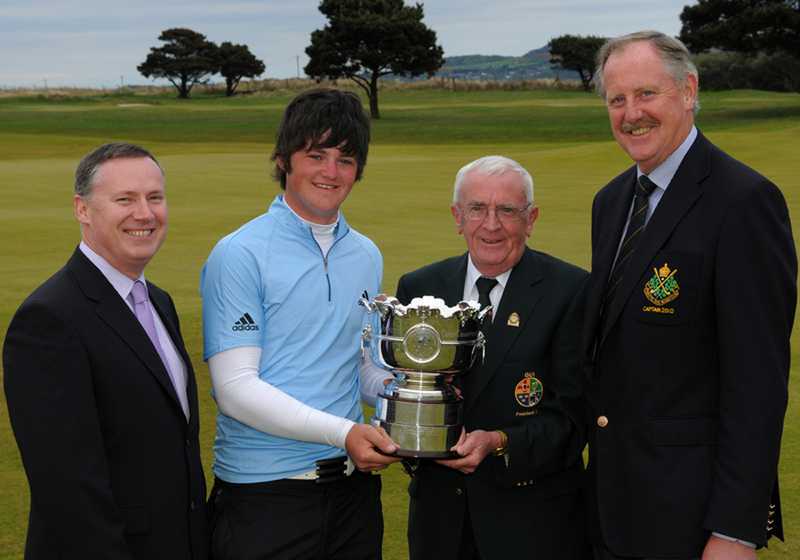 Sean MacMahon (President GUI) presents the Irish Amateur Open Trophy to the winner, Alan Dunbar (Rathmore Golf Club). Also included are John Rice (General Manager AIB, sponsors), left, and David Kennedy (Captain The Royal Dublin), right. The Ulster golf conveyor belt produced yet another outstanding champion when Rathmore’s Alan Dunbar held off a final round challenge from Scotland’s Kris Nicol to end Ireland’s seven-year wait for a home winner in the AIB Irish Amateur Open at Royal Dublin. 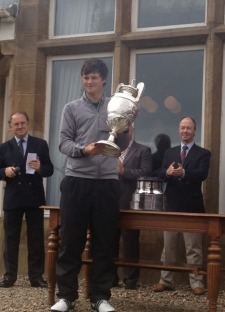 Alan Dunbar lifts the trophy. Photo via @MrAndrewCotterRathmore’s Alan Dunbar will return as a conquering hero to Portrush for next week’s Irish Open following his nerve-tingling one hole win over Austria’s Matthias Schwab in the 36-hole final of the Amateur Championship at a wet and windy Royal Troon. The 22-year old, who as champion will now tee it up in next month’s Open at Royal Lytham and earn an invitation to the 2013 Masters and US Open, lagged a 50 foot birdie putt at the 18th to two feet with the match all square and looked on as his young opponent missed a four footer that would have extended the match. 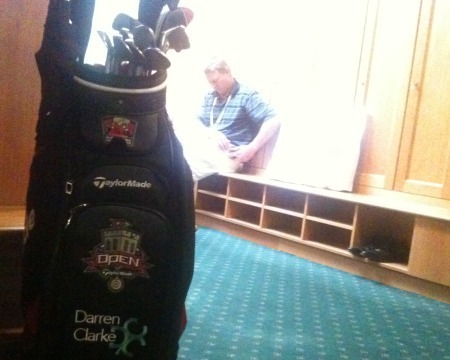 Dubliner John Mulrooney checks his text messages after helping Darren Clarke win the Open in Sandwich last year. Now he’s trying to steer Alan Dunbar through his first major at Royal Lytham & St Annes.Amateur champion Alan Dunbar has a Major advantage this week - the caddie that helped Darren Clarke win the Open. Alan Dunbar believes he has the game to make it as a professional. When he turns pro remains to be seen. Picture Fran Caffrey www.golffile.ieAlan Dunbar has joined Darren Clarke and world No 3 Lee Westwood in the ISM management stable under new amateur rules. Alan Dunbar in action at Augusta NationalAlan Dunbar looked to be heading for one of the highest rounds in Masters history but battled back bravely to salvage an 83.